Day 1: Kolkata – Sonakhali/Godhkhali, Sunderbans. 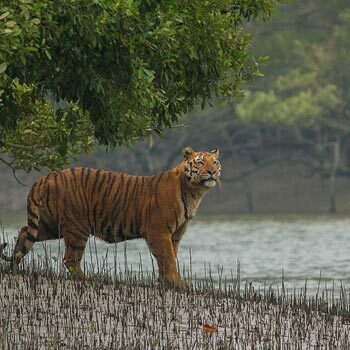 Your Sunderbans Tour 2n 3D starts with your pickup from Kolkata in an exclusive vehicle and drive to Sonakhali/Godhkhali, a journey of about 3 hrs. After obtaining requisite Forest permission we transfer you from Godhkhali jetty by motor boat to the tourist lodge located in the Sunderbans Islands. This journey would take you down the rivers Hogil, Gomar, Durgaduni and Gumdi in about one and a half hour. In the afternoon after lunch, set off on motor boat to the Sunderbans National Park and view wildlife from the Sajnekhali watchtower and visit the Sajnekhali Museum and Mangrove Interpretation Centre. This Watchtower provides one with an opportunity to view wildlife from close quarters. After watching the sunset, we return you to your resort either to rest or if you are interested, you may enjoy an entertaining evening of Folk Dance “Banbibi Pala”(Optional). Dinner and night halt at the forest resort/boat. The second day involves a full day cruise through the rivers and narrow creeks of the Sundarbans National Park and a lovely birding experience. Food would be prepared and served on the launch itself. Start after bed tea and visit the watch towers of Do Banki. The canopy walk at Do Banki gives you an opportunity to view wildlife from a netted enclosure. Thereafter, enjoy the thrill of cruising deep in the Sundarbans National Park and also around the islands of the Sunderban Tiger Project Area. Let yourself be guided by our Naturalist and Guide to view the Mangrove forest from close quarters, deep inside the creeks and return in the evening. You can chose to visit the village around the resort and learn about the experiences of the villagers in the forest. Meet the fishermans, the Honey Collectors as well as the woodcutters and share their experiences of the Jungle. Overnight stay at the forest resort/boat. 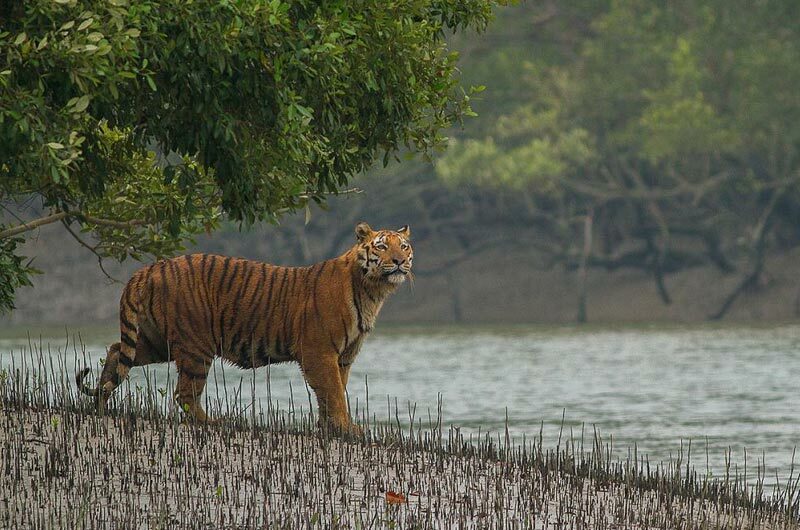 In the morning, we cruise along the waterways and take you to another portion of the Sundarban Tiger Reserve. This involves cruising through the creeks of Pirkhali and visiting the watchtower of Sudhanyakhali and Jharkhali (Optional). Most of the tigers are sighted from the Sudhanyakhali tower. Some other wildlife like axis deers, wild boars and crocodiles may also be seen from this watch tower. This watch tower has a capacity to host 25 persons at a time. There is a sweet water pond where animals come to drink water. Behind the pond are long stretches of observation lines, bereft of any vegetation where one can sight animals from a distance. The Brahmini Kite, Brown Winged Kingfisher, Jungle cat as well as the Monitor lizards is very often sighted from the Sudhanyakhali Watchtower. Option 1: Thereafter, we can opt to cruise through the creeks and canals of the Sundarban Tiger Reserve looking for a chance to spot the Royal Bengal Tiger and other wild animals and after lunch on the boat, at around 12:00 – 12:30 hrs, depart for Godhkhali. Option 2 : (Depending upon India Beacons choice): Visit the Jharkhali watchtower and depart from Jharkhali. After lunch on the boat, at around 12:00 – 12:30 hrs, we depart for our last destination, Jharkhali. At Jharkhali, visit Asia’s first Tiger Hospital wherein at present two tigers are kept for treatment and recuperation. Arrive at Kolkata by about 16:30 / 17:00 hrs. Your Sundarban tour ends with sweet memories. After lunch at the resort/boat, at around 12:00 p.m, we depart for Godhkhali to be transferred to Kolkata. Arrive at Kolkata by about 5:30 / 6:00 pm. Your Sunderbans 2N 3D tour ends with sweet memories.